BELIZE. Government of Belize. 20 Dollars, 1974. P-37a. 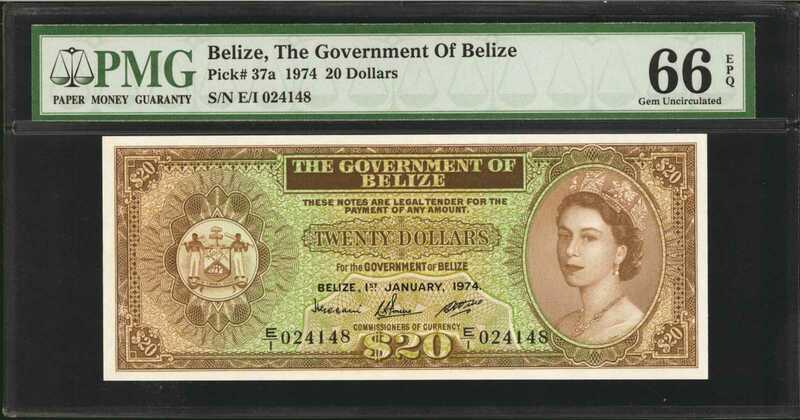 PMG Gem Uncirculated 66 EPQ.The highlight piece of this fine section of Government of Belize QEII notes we are offering and of a quality bests any we have seen. The note is simply stunning and seen with vivid inks and striking detail throughout. Boardwalk margins evenly house the impression and the face to back registration of the designs is outstanding. This note exceeds most issued British Honduras notes in rarity save for the first or second issue, and is a key date to any complete Queen Elizabeth II collection. PMG has only graded two of these gems, with none finer.PMG Gem Uncirculated 66 EPQ.